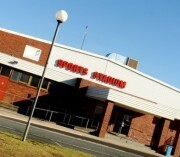 The Greater Shepparton Indoor Sports Facilities incorporate the Shepparton Sports Stadium, Tatura Community Activity Centre and Mooroopna Stadium. Spend some time exploring our website and we're sure that you'll find a sport or activity to keep you healthy and enjoying life! Shepparton Stadium sports and programs include badminton, basketball, table tennis, netball, indoor soccer, a range of junior programs including Aussie Hoops, Aussie Net, Mini Minton and Junior Stadium Netball, a range of older adults programs such as Strength Training and Tai Chi, and social competitions including Ladies Social Netball and Corporate Challenge. Also operated by the Greater Shepparton City Council is the Tatura Community Activity Centre and the Mooroopna Stadium. The Tatura facility provides the local community with opportunities to participate in basketball, badminton and table tennis. The Mooroopna Stadium hosts Jets Gymnastics who provide the local community with a range of excellent programs. There aren't any events to display at this time. Please check again later.